Butler Mobility is a distributor and installer of stairlifts in Central Pa for Stannah Stairlifts. Stannah is a family owned business with over 140 years of experience in the lifting industry – challenging and setting standards in stair lift design for more than 40 years – with over 600,000 satisfied customers. Stairlifts that are thoughtfully designed to be safe, reliable, attractive and easy to use. A practical, easy and inexpensive solution for total access of your home! Stairlifts are also known as chair lifts, stair chairs and stair climbers. Listen to Ken Matthews on iHeartrRadio talk about our product and services. Listen to our ad from Ken Matthews about our discount that’s only going to be around for the next 2 months! Ask about our rental program. Perfect for short-term needs! • On/Off switch prevents chair from moving unexpectedly. • Seatbelt – Fastens and unfastens with one hand. 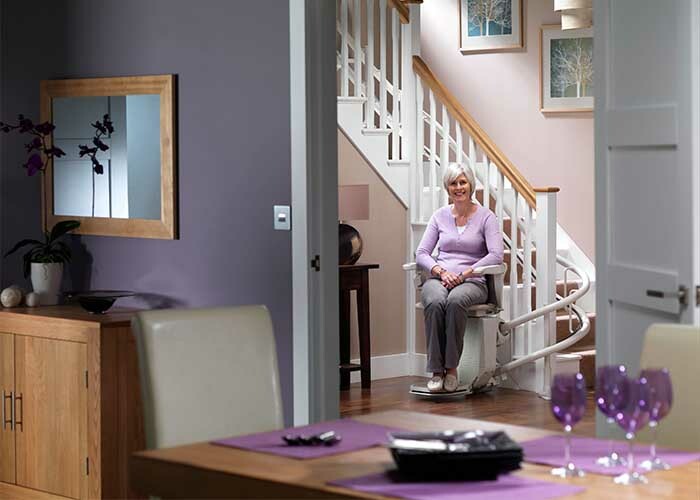 • Safety sensors – Stops the stairlift if it meets an obstruction. • Armrest Safety – Down-side armrest must be lowered when riding the chair. • Easy Folding Armrests, Seat, and Footrest- The armrests and seat easily fold up out of the way. The footrest folds automatically with the push of a button. Eliminates the need to bend over to fold up the footrest which is especially important at the top of the stairs. • Key Lock – Prevents unauthorized us of the stair lift when the unit is not in use. • Swivel Levers – The swivel levers, or optional one or two-way powered swivel, allows you to get on and off your stairlift in the safest position at the top or bottom of your stairs. • Ergonomic Controls – The slimline control allows you to use any part of your hand to operate the stairlift. Designed for arthritic finger and persons with limited use of hands. • Upholstery – Comfortable, waterproof or woven upholstery available in choice of colors. • Chair width options – Standard 19-1/2” between armrests. Slim model – 16” between armrests. • Adjustable Seat Height – Customized for your needs and comfort. • Longer Armrests – Aids the user in getting in and out of the chair by not having to reach behind them to push up out of the chair. • Longer Footrests – Strong enough to stand on while getting on or off your stairlift chair. • The stairlift plugs into a standard outlet. • Provides a quiet, smooth ride. • Installs into the home without any modifications to the home! • Leaves the stairway clear for use of stairway by others. The stairlift chair folds up out of the way when not in use. • Fits all types of stairways – Straight or curved; narrow or wide! 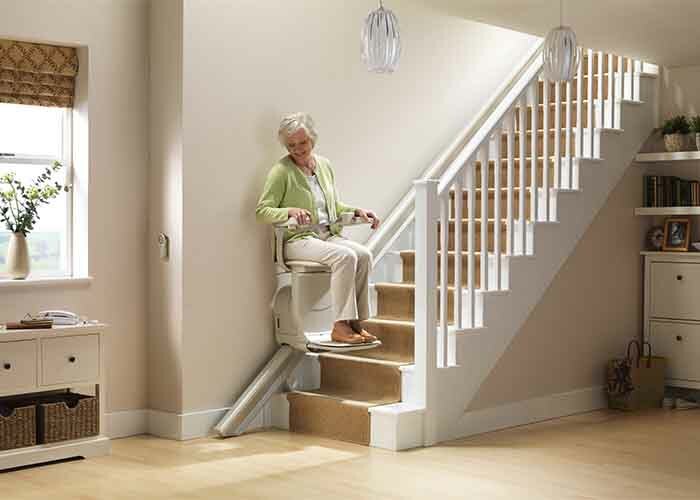 • Will function even during a power outage to get you safely up or down your stairs!